Currently there are numerous digital tools available to (theoretically) reduce our reliance on paper in our work environments, yet personally I seem to be handling just as much paper today as I did in the past. But in this age of open office environments and limited storage space, it’s important to implement effective systems to manage the relentless flow of information. 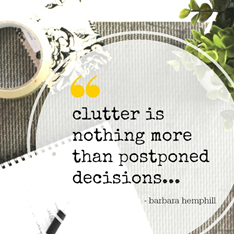 According to Barbara Hemphill, author of “Taming the Paper Tiger at Work “, “clutter is nothing more than postponed decisions.” Her statement sums up my workstyle so well. I delay making a decision until I’ve figured out the smartest place to store something with the goal of being able to easily retrieve the information again when or if needed. The problem with this plan is that paper continues to accumulate in my workspace until that storage decision is made. Frustrating! Overcoming this challenge is a work in progress for me. Here is my current process for taming the paper monster on my desk. Just like most of you reading this, my days are filled with competing priorities and multitasking. I make time to routinely review and quickly analyze the items in my inbox. My approach is similar to triage in the ER - assign degrees of urgency to what needs to be done. As I go through my inbox I use sticky notes to flag required actions such as to be copied, requires a phone call, needs approval, etc. I then clip similar action items together and do them in batch mode which is more efficient for me than handling each action individually. On reference documents, I highlight or flag the most critical info. This makes the main point obvious and saves me from having to hunt for it every time that document resurfaces. From reference items I also log brief notes into my journal notebook that is always open on my desk and is taken with me to every meeting. Having a portable central record helps me overcome the concern that once something is filed out of sight, it could slip my mind. Once I’ve jotted down the important points, the paper is then free to be filed, scanned or shredded. Finally, I have added a recurring filing appointment to my Outlook calendar as well as semi-annual shredding. I still have too much paper clutter but these steps are helping me to make progress. I may never achieve a fully paperless office, but the more piles I can eliminate, the better. I apply some of these same strategies to managing the flood of information that I receive digitally. Software such as Outlook, Google Drive, Dropbox and Evernote are amazing tools for categorizing and retrieving data. But in the end, the key to eliminating either digital or paper clutter is to eliminate postponed decisions. I’m working on it. SDA has some great resources including an article in the Office Administration PEG section "Conquering Clutter the 5S Way" and a webinar recording "Get Organized to Make This Your Best Year Yet". Check these out when you have a chance. In the meantime, share in the comments below your tips/tools/resources that you use to reduce the amount of paper clutter on your desk. with Rosser International in Atlanta, Georgia. As I get older, it is driving me crazy. I made a deal with my brain. I would try to keep my desk mess to a minimum. I knew that I had to create a habit of cleaning my desk and that it would take me 21 days. After 23 days, I have done a pretty good job of keeping the paperwork to a minimum. I have created a one touch policy – only touch the paper once and don’t put it in a pile (this has helped the most). I have also started sending people to the correct person instead of work flowing through me. The one thing that has stood out in this process is how impressed everyone has been on my progress and that they noticed. So I ask myself, "Why didn’t I do this years ago?" What about you? Is your desk neat and tidy, or full of piles of paper? Share your greatest tip for keeping a clean desk in the comment section below. Sabrina Heard, CDFA, is Office Manager with Randall-Paulson Architects in Roswell, Georgia. She currently serves as the SDA National Treasurer.